I'm not sure what cricket Walt Disney used as the basis of his cartoon character, Jiminy Cricket, but it sure wasn't one of ours! But how do you identify a cricket? And what makes it different from a grasshopper? And what then is a bush-cricket? And can they be helped in gardens? Many of you will know that all this gardening for wildlife stuff I do is not my day job - it's my hobby and out-of-work passion. But I've found a sneaky way to take it into work with me! Life is sweet when you can mix together your favourite things, and last weekend was the perfect combination - sport and gardening. I don't mean that I got to compete in speed-weeding or synchronised digging. No, I was one of the lucky ones who got to go to the Olympic Park to see the high diving final (go, Tom, go!) 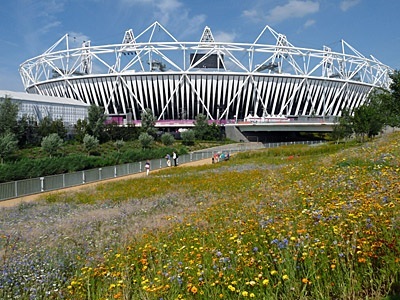 and at the same time enjoy the special Olympic planting that had been done on a grand scale. Regular readers will know that I'm a firm advocate that you don't need to live by the mantra of 'native native native' when it comes to plants in a wildlife-friendly garden - there are plenty of non-natives that are simply brilliant (but you do have to choose carefully). But I do like it when a native plant looks great in a garden and is wonderful for wildlife at the same time.